You can gather a lot of fanciful stories related to snakes, some very weird but true, others totally false. 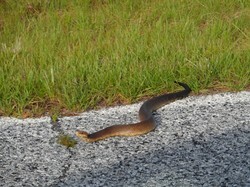 This article is about four of the more common falsehoods about four often seen snakes here in the Deep South. As a former teacher and Okefenokee Swamp lover, I think the more you can know about the wildlife of the region, the more likely you are to be unduly afraid. Therefore, the more you should be able to relax and enjoy the beauty of nature. THE TALE: As a child growing up in the Deep South, I was always taught to avoid the coachwhip snake and if I saw one I was to walk away quickly. The tale was that he would chase you, wrap around your legs and whip you violently with his tail and hurt you. To a small child this was very frightening! THE TALE: I was taught as a child that this snake would roll himself into a hoop shape by grabbing his tail in his mouth and that he would roll down the road or across a field to escape danger. Some believed that he would chase you using this technique. THE TRUTH: The simple truth is that stories of this snake are fiction. Though, honestly, I believed them as a child and into adulthood! Scientists have never been able to prove that these actually exist. At one point a $10,000 reward was offered to anyone who could prove their existence. There is at least one internet site which has a funny article about Hoop snakes and claims they came into the US from New Zealand. Don’t believe it! If you will find and read that article, you will see that it is not true and is written for laughs. THE TALE: As a child I was taught that this snake would sneak into a farmer’s barn and nurse at the udders of milk cows, which would deprive the farmer of milk. They were also rumored to nurse off of cows which had calves which would mean less milk for the calf. THE TRUTH: Now this snake does exist, BUT it doesn’t drink milk from a cow’s udders! It is a type of King snake. The scientific name is Lampropeltis triangulum. There are 24 sub species of this type of snake. These snakes seem to make docile pets and many people keep one for a pet of sorts. You can even find “How to Care for Milk Snakes” handouts and instructions online. King snakes typically eat other snakes or small rodents. THE TALE: Some people believe that these snakes cannot bite underwater. Most snakes in the US are not poisonous; however you should treat all snakes with respect and not disturb them. Most of them are beneficial and help keep populations of rats, mice, frogs, toads, and other small creatures in check. Enjoy looking at them, photograph them, but let them go their way. Even the bite of a non-poisonous snake can become infected and cause you problems. I have learned a lot about snakes in recent years and it's amazing how many fictional stories are built around them. We also have myths about snakes milking the cows, but other presented tales are new to me. I agree with you - they are important part of ecological balance and it's best to leave them doing their job with least possible amount of disturbance. Never heard of that one. I'll have to look it up. I live in the desert in Arizona, so I never see these snakes mentioned here. But, we have our own threat of the Mohave Green Rattler! Copperheads are rare down here, but if you drive just 100 miles north they are more common. I've only seen one in my lifetime on this end of the state. Coral snakes are here but rarely seen because they stay hidden. We have large numbers of rattle snakes (3 types) and cottonmouths. In this area we have cotton mouth snakes, as well as coral snakes, copperheads, and a few rattle snakes, with the cotton mouth being the most numerous.